At least it's fresh though, right? 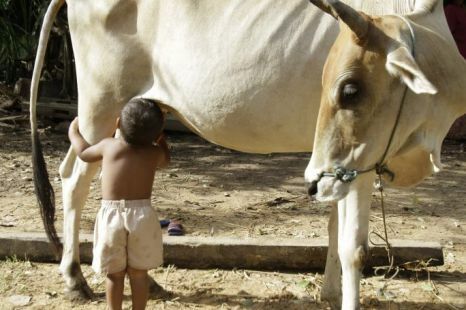 Forget drinking milk from the carton – this young Cambodian boy goes straight to the source. Tha Sophat, just 20 months old, lives partly on milk he suckles directly from a cow since he saw a calf do the same, according to his grandfather. Um Oeung said his grandson started suckling the cow in July after the boy’s parents left their rural village in search of work. He said he pulled the boy away at first. He relented after his grandson protested loudly and the boy has suckled the cow’s milk once or twice a day since then.